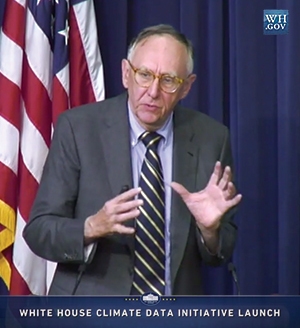 During the launch of the Climate Data Initiative at the White House in March, Dangermond said many local government agencies and other organizations already use the company's GIS technology for planning, engineering, and disaster response. "What we are doing is engaging with different federal organizations to read climate information directly from NOAA and USGS as services that can empower all these state, local, and private sector organizations with tools that can bring climate change information to life," Dangermond said. For more information about the Climate Data Initiative and president Barack Obama's Climate Action Plan, read the White House blog. A fact sheet from the White House outlines the commitments for the initiative by the government and Esri and other companies. For more information about Esri's role, read Dangermond's blog post "Supporting the White House Climate Data Initiative" on Esri Insider.